The ESV Study Bible, Large Print edition features the content of the award-winning ESV Study Bible with a highly readable, large-print type. A new typesetting allows for increased readability while maintaining the same trim size as the original. All of the original's extensive articles, 20,000 study notes, 240 maps and illustrations, charts, timelines, and book introductions are included in a two-color interior. Those looking for the ESV Study Bible in a large-print format will enjoy this readable edition. 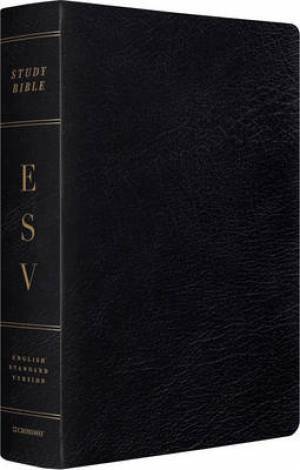 ESV Study Bible by English Standard was published by Crossway in July 2014 and is our 19034th best seller. The ISBN for ESV Study Bible is 9781433544316. Be the first to review ESV Study Bible! Got a question? No problem! Just click here to ask us about ESV Study Bible. Is this copy in English (not American)? A:This is in Americanised English. Thank you for using the Q&A Forum. A:The font size of the Bible's text is point 10.75, and for the notes is point 8.75. Thank you for using the Q&A Forum.